GENEVA, July 22, 2016 — The Geneva-based non-governmental human rights group UN Watch today urged UN chief Ban Ki-moon to respond to an appeal by 50 Venezuelan NGOs (see below) expressing indignation at an array of UN humanitarian agencies that are deferring to the regime of President Nicolas Maduro and ignoring the hunger and health catastrophe taking place in Venezuela. 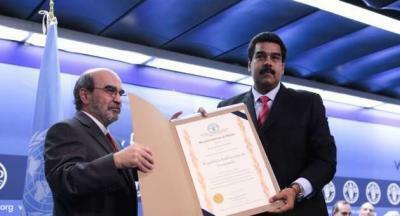 The coalition of NGOs pointed a finger at UN agencies such as PAHO, FAO, UNDP, UNFPA, UNICEF, and WHO, which have adopted an unresponsive stance in the face of the compelling health and food needs affecting millions in Venezuela, apparently due to pressure from the Maduro regime. “The UN says that it cares about social and economic rights, yet when it comes to Venezuela, UN agencies and officials have continuously helped the perpetrator instead of the victim,” said Hillel Neuer. “Likewise, Hilal Elver, the current expert on the right to food, has never visited Venezuela, issued any statement on hunger in Venezuela, or made even one tweet on the subject. It’s shameful,” said Neuer. 50 Venezuelan civil society organizations wish to express our indignation and rejection of the conduct and silence of several of the agencies of the United Nations System established in Venezuela, particularly PAHO, FAO and UNDP, in a context of a rapid increase of poverty levels, economic and social fragility and political and institutional instability, in which the population faces massive and severe shortages of food, medicines and medical supplies across the nation and the lack of internal capacity to solve this situation in the medium term. UNFPA and UNICEF have also opted for restricting their activities to the implementation of some programs, keeping away from this very serious situation, which primarily affects pregnant women, children and adolescents, the elderly, rural and indigenous communities, as well as persons deprived of liberty. On Tuesday July 19, 2016, during the press conference held by the Information Service of the United Nations, its Director, Alessandra Vellucci, said the briefing on Venezuela on Friday 15 had been suspended “because colleagues from the different agencies did not have enough information for a full-fledged briefing”. Fadelia Chaib, of the World Health Organization (WHO), said that she “would check again with PAHO what action they were taking and what information they were receiving from the country. As soon as there would be more information, it was not excluded that WHO would brief the press on the topic”. Since 2013, civil society organizations have sent information to these agencies and have even conducted peaceful protests in front of PAHO´s office in Caracas, drawing attention to the generalized failures in the provision of medicines, supplies and services. FAO has also been informed about the progressive deterioration in the nutritional status of the population, since 2012. Since March 1, 2016, the United Nations Office of Humanitarian Affairs (OCHA) is aware of the humanitarian nature of this crisis. The UN agencies refrain from dialogue with Venezuelan society, without pressure or conditions by the State. This situation compromises their performance, according to the Action Plan “Rights up Front”, which establishes their duty to prioritize, above the interests of states, the mandates and commitments on human rights and to provide accurate information regarding populations at risk or subjected to serious violations of human rights, to ensure coherent strategies for action on the ground, facilitating an early coordinated action and greater impact on the work of protecting the rights human and humanitarian law. The health crisis affects 120 thousand people with complex conditions, 3 million with hypertension and diabetes, 90,000 with malaria —the majority of them indigenous and mine workers— and 60,000 with dengue. Maternal mortality increased from 66 cases per 100,000 in 2015 to 116 in 2016, according to official figures. In 2015, 12.1% (more than 3 million people) reported eating 2 times a day or less, and 87% reported not having enough money to buy food. In the first half of 2016, nutritional deficit reached 12% in urban areas, 19% in peri-urban areas, and 27% in poorer areas. In major hospitals in the country, cases of severe child malnutrition are reported, including diagnoses of marasmus and kwashiorkor. In light of this situation, it is unacceptable that the briefing on Venezuela had to be suspended “because colleagues from the different agencies did not have enough information for a full-fledged briefing”; it is unacceptable and breaches the principles of “rights up front” that neither the OHCHR is receiving reliable and timely information from the UN agencies. What then are the Pan American Health Organization, the Food and Agriculture Organization, the Population Fund, the Children’s Fund and, in particular, the United Nations Development Programme doing in Venezuela? After the suspension of the briefing on July 15 and what was expressed during the press conference on July 19, it seems undeniable that the agencies have not even informed their own headquarters on the crisis in Venezuela, a situation that endangers thousands of people, especially the most vulnerable. The United Nations System cannot continue “failing to fulfill its responsibilities” in Venezuela, in order to be able to prevent irreparable consequences in terms of loss of life and further escalation of the deteriorating food and health conditions in the country, affecting the most vulnerable, if it does not implement, as quickly as possible, a mechanism of international cooperation and humanitarian assistance.